Transforming the challenging terrain of the high desert into a rich and productive garden will serve school and community by providing a place to learn about small-scale food production, environmental stewardship, building soil and conservation of water. In addition, teachers are developing lessons in all grades and subject areas that can be taught in the garden making it an effective laboratory for learning. During the summer months the garden can be a community garden serving families in the school. While much of the basic infrastructure is installed, the garden space requires additional raised beds, soil amendments, drip irrigation and weed barriers. In the garden plan we include perennial fruit bushes and trees, perennial herbs, and grape and spineless berry vines on the fences. Additional wildflowers, native plants and drought tolerant flowering shrubs will beautify the area surrounding the garden to attract pollinators. The garden is ready for the new school year. 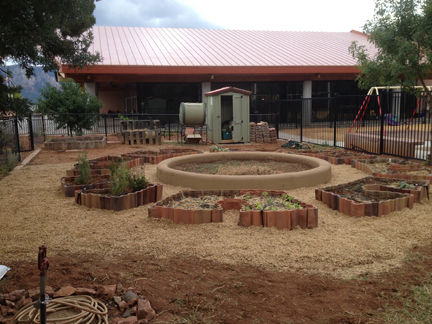 The garden is the centerpiece of the overall sustainability plan for West Sedona School. It provides an area for composting and will become a venue for STEAM (Science, Math, Engineering, Art and Math) and sustainability education. It will be a site to stimulate learning about local food production, recycling, energy and water conservation, and the study of land, native plants and weather. Some 64% of the students are eligible for the National School Lunch Program and up to 275 students have participated in the weekend Backpacks for Kids Program. The garden will provide important nutrition education and can provide some fresh vegetables for participating families. This entry was posted on Thursday, August 28th, 2014 at 8:30 am. 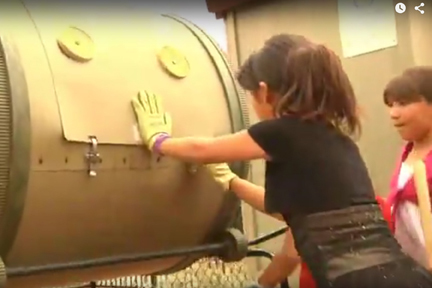 It is filed under SCHOOL GARDENS PROGRAM, VIDEOS, West Sedona School. You can follow any responses to this entry through the RSS 2.0 feed.